I'd say I get a dozen or more emails a month asking about careers in medical billing and coding that can be done from home. I haven't ever done this type of work – I don't have any of the training needed – but I have talked to moms just like me that work at home – but their job is medical billing, coding or transcription. So I am always picking their brains and researching this career field, so that I can pass along helpful advice or facts to you. I think it's important to know all you can about something before you dive in. This is especially important if you're thinking of leaving a job outside the home to pursue a career like this. If you don't have the training or you can't find work – then you'll have bigger problems than just wanting to work at home. Be smart – research it! 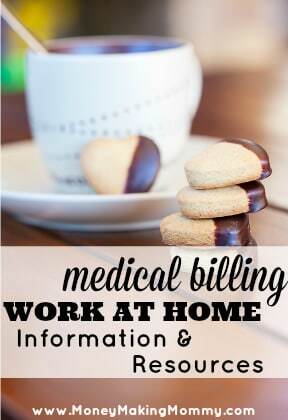 I am currently in the process if building this resource page, but I do have a few articles below that you can check out that touch on doing medical billing and coding from home. The more I learn and research, the more I will certainly add to this page. **Thank you to everyone that has commented below. It is helpful to hear from those that have done this type of work or who can offer information. To any newcomers – please feel free to post your comments below as well. I have been working as a medical biller for a mental health/substance abuse facility for the past seven years. I bill Medicaid, Medicare and Excellus BC/BS. I am interested in working from home. Can you direct me? I’ve been a Medical Biller/ Collector for over 20 years. I’m ready to work from home. I really need help. I have my Associates Degree in Medical Billing and Coding. I have no experience but I do have some in office experience, where I worked at Lakeshore Surgical Practice part time as a Receptionist. I would like the opportunity to get into what I went to school for and gain experience, so I may work from home. Thank You. I have my Associates degree in Medical Office Management with a focus on Medical billing, although I do not have any hands on experience I would appreciate the opportunity of someone giving me a chance to use my skills. If there is anyone that can help please email me at the above address and I will be grateful for any assistance or opportunity given to me. Thank you. I have my Associates Degree in medical billing and coding. But I have no experience. I would like to work from home, and it is hard for me to get a job with no experience. Can you help me?